When I have children, I will frame this illustration and put it up right next to the framed print of the Golden Rule. "Do Unto Others..." and "Hang Your Curtains Close the Ceiling..." are two life lessons the Shuffler children will learn early. I don't believe in "decorating rules," (an oxymoron to me) but I will say that hanging your curtains to maximize height is the common sense approach. It makes SUCH a difference to hang panels floor to ceiling at the maximum width your window will allow. 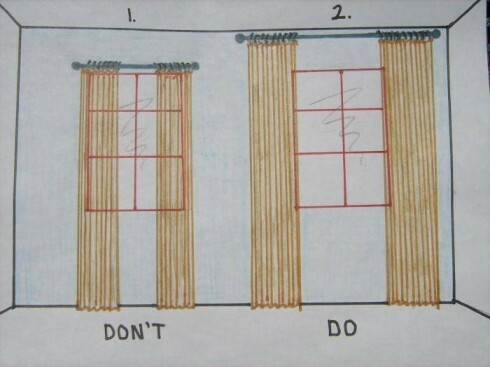 Do good unto your curtains. And with that little nugget, I leave you. Have a fantastic weekend...see you Monday! It amazes me when people come into my house and say, "Wow, I never would have thought of hanging curtains that high." Then they ask me why my curtains aren't up off the floor and the lesson begins. I just explained this concept to my husband earlier this week! We'll be hanging drapes up high this weekend. lol! This post totally made my day!! So true, so true! Fantastic... that picture makes it so so clear! Have done that in my house, and I get asked a lot of questions about it! Yes! In addition to this golden rule, the only other decorating "rule" I follow is the one about never hanging pictures too high. ha ha, yes, the golden rule ! Well, right after... Don't bleed on the fabric ! When you sew a lot it can happen.